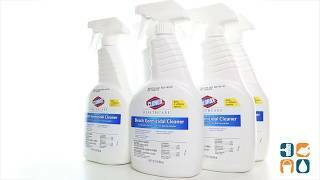 The Clorox Healthcare Bleach Germicidal Cleaner is a convenient 1:10 bleach solution such as those recommended by the CDC for infection control protocols. This Clorox Bleach Germicidal Cleaner is stable and pleasant to use. In addition to being a fast, broad-spectrum disinfectant, DISPATCH spray is also an excellent cleaner because it contains detergent and an anti-corrosive ingredient that minimizes damage to surfaces and equipment. 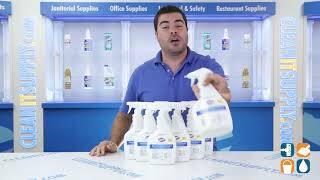 The Clorox Healthcare Bleach Germicidal Cleaner spray can be used on a variety of hard, nonporous surfaces such as stainless steel, glazed ceramic tile, hard plastics, nonporous vinyl, painted surfaces, Plexiglas, laminated plastic counter-tops, fiberglass (sealed) surfaces, glazed porcelain and glass. May be used for instrument pre-cleaning and disinfection of noncritical instruments. May be sprayed directly onto the surface or applied with a clean cloth, mop or sponge saturated with DISPATCH product until the surface is completely wet. A saturated microfiber cloth will deliver optimal surface area coverage.